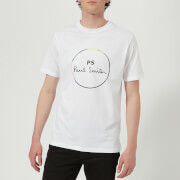 Men's 'Emeric' T-shirt from A.P.C. with a crisp cotton construction. Cut in a straight fit, the jersey tee comprises a crew neckline, short sleeves and a topstitched hem and cuffs. Complete with an A.P.C. logo silkscreened on the chest.